hors d’ oeuvres are served…. The other day I was looking for something healthy for dinner and I decided to flip to the appetizers section of my Paleo Diet Cookbook. I wasn’t super hungry….I just wanted something yummy and easy for dinner that wouldn’t pack on the pounds. I settled on two recipes, tweaked them slightly (as always) and now I bring them to you! Super tasty…perfect for two, or for a party! Dinner is served! 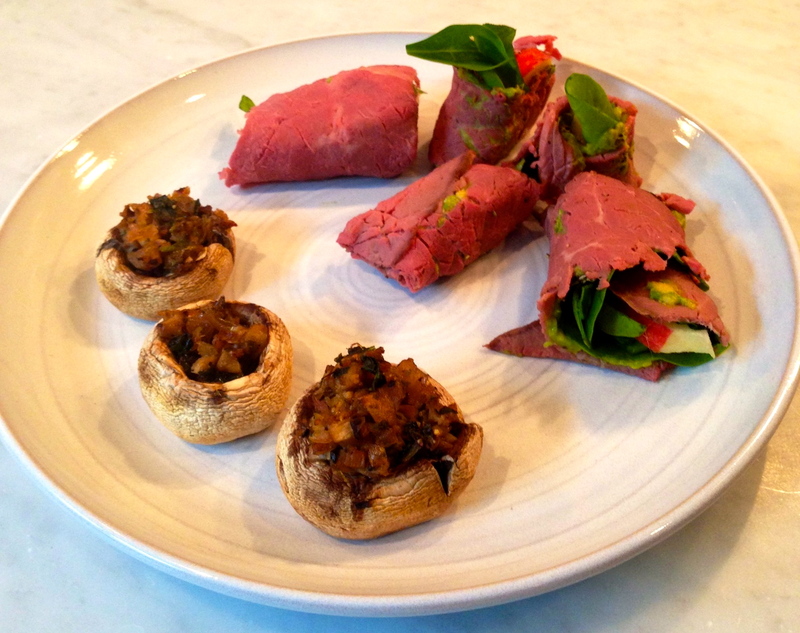 Stuffed Shrooms and Mini-Roast Beef wraps. 1. Preheat oven to 400 degrees. Remove stems from mushrooms, chop finely and set aside. 2. Heat olive oil in a saucepan over medium flame. 3. Add garlic and shallots and saute for two minutes while stirring. 4. Pour in white wine and bring to a slight boil. 5. Toss in chopped mushroom stems, parsley, basil and oregano. 6. Reduce heat to low and simmer for five minutes. 7. Remove from heat and drain off any excess liquid. 8. Spoon into mushroom caps. 9. Place on cookie sheet and bake in oven for 20 minutes until mushrooms are tender. 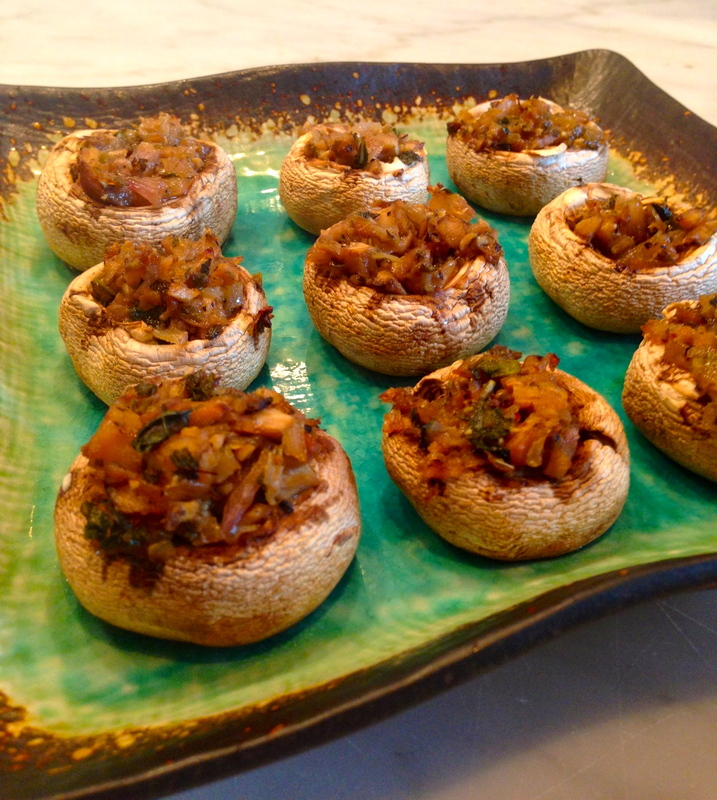 Stuffed Shrooms. Sooo yummy. Get ’em while they’re hot! 1. Lay roast beef slices out on a cutting board or other smooth surface. 2. Mash avocado until it is spreadable (like guacamole.) Using a butter knife, spread onto each slice of roast beef. 3. 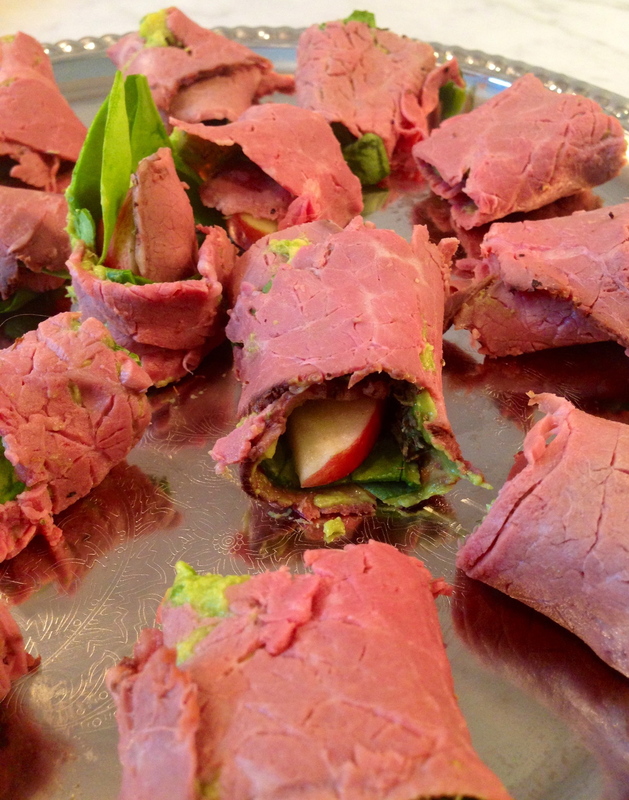 Layer with spinach and apple wedges. 4. Sprinkle with oregano and rosemary. 5. Roll to create wraps. YumYum! I am going to try these for sure. Wonder if you could use grilled venison cube steak instead of the roast beef? Might have to pound it to make it thinner.